An earlier version of this essay appears in the Winter 2009 issue of educational Horizons. by Edward G. Rozycki, Ed.D. Politics in the Schools What is Hypocrisy? Unlike school systems in many countries, American public (i.e. state-sponsored) schools are not centralized in a unitary system. There is no one authority that establishes curriculum, graduation or attendance requirements. These functions are exercised independently by each of the fifty States. Scattered among these States are over fourteen thousand independent school boards which provide the basic funding and day-to-day governance of local schools, interpreting, often adding to or ignoring, State level directives. There is nonethless a substantial amount of contracted-for Federal funding conditioned on following federal guidelines. This brings along with it often dismaying interference in (or welcome assistance with, depending on one's perspective) local governance. American public schooling is, consequently, highly, albeit often surreptitiously, political. Despite often loudly declaimed misgivings from American educators at all levels, politics in schooling is far from being an unalloyed evil. In all but the most placid of environments, politics is inevitable in organizations. It must occur at some level of organizational decision-making, if rules, policies, traditions are indifferent to circumstances and personal judgment need come into play. In one of its most important dimensions, politics is the accommodation of individual interests via means not openly sanctioned within an organization. Importunities may arise which cannot be accommodated within given frameworks of priorities, so "adjustments" are often made with an eye to "discretion" and the avoidance of "setting a precedent." By the same token, despite enthusiastic invocations from persons in the worlds of business and government, productivity is far from being an unalloyed good. Productivity single-mindedly pursued, particularly in the context of restricted resources, may stultify important organizational capacities. 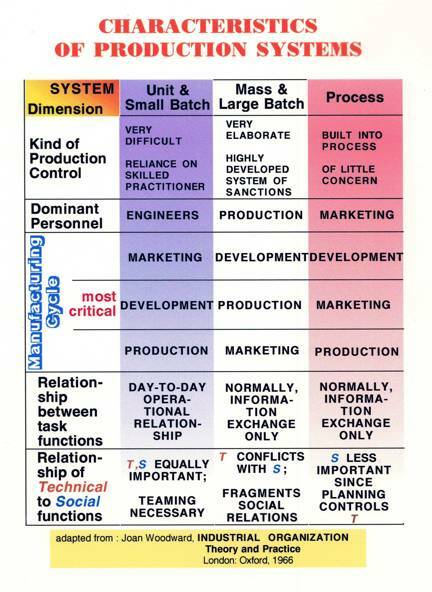 Industrial organizations, writes organizational sociologist Joan Woodward, fall into three classes depending upon their goal, i.e. the kind of product they make, and the kind of technology they use to produce it. What is most important for those of us who contemplate promoting change in schools is Woodward's finding that, in the most successful of the types of organization she analyzes, their goals and technologies affect profoundly both the productive and social relationships between workers. In other words, what we try to do and how we go about doing it affects the way we work together, our productivity and our politics. Despite a not quite comfortable fit, large batch and mass production industries have provided Americans with a modern Factory image of the school. According to Woodward, the goal of such industries is to produce uniform items for a pre-existent mass market. Their technology, although complex, can be made piecemeal. Causal connections are generally clear. Uniform inputs produce uniform outputs. This diminishes the need for research and development. Management separates itself from, as it controls, low-skilled workers through a variety of highly elaborate sanctions. Communication occurs only to exchange information of interest to management. The technical rationality of the workplace tends to fragment social relationships as these tend to undermine efficiency. In American schooling, this industrial model is reflected in attempts to standardize curriculum, testing, and promotion standards. The model is ignored in Special Education and by proponents of the doctrine that the individual needs of each child should be met by the schools. It is also undermined by opening the public schools to all comers, using age as the only prerequisite for acceptance, rather than attempting to standardize admissions criteria in any productively, e.g. pedagogically, relevant way. Process industries such as oil refineries, chemical plants, and pharmaceutical companies are technology-rich. They produce specialized products for hard-to-identify specialty markets. Complex though well-defined causal processes are built into plant equipment so as to minimize the need for workers. Those few workers who are needed tend to be highly skilled technicians who can maintain and troubleshoot the production process. Control by management is of little concern since both the equipment and the technical orientation of the workers assures success. As in the mass production industries, communication is necessary only for exchange of information. The technical rationality of the process does not support -- though it need not undermine -- the social relationships of organization members. This model is dear to the hearts of all technically adept educators, whose main failing is often little more than the assumption that their successes rests solely on their own pedagogical skill rather than on characteristics, not under their control, of their classrooms or students. The model is actively promoted by teacher accrediting organizations working hard to impose as doctrine on would-be teachers the belief that all children can learn and that even future adult behavior can be controlled through early school interventions. Unfortunately, little consensus exists that there is scientific support for these propositions. Unit and small-batch industries, in Woodward's typology, produce custom-designed specialty items, such as locomotive engines and custom cars. Specialty demands provide the impetus for the research and development of processes and methods which take the very specific characteristics of inputted material and, with much skilled worker attention, transform it into relatively unique outputs. Management-worker relationships tend to be non-hierarchical and communication occurs on an operational basis as the process requires it. Since teaming and mutual support are often necessary, social relationships are as important as technical ones. This is what private (and otherwise small-school) education is about, although small budgets often cut into the possibility of hiring highly-skilled teachers or administrators. But every parent (especially of smaller children) likes to believe that their offspring are getting special treatment. In the public schools this dream is supported by the charade of the IEP, individualized educational placement, that students admitted to special education receive. 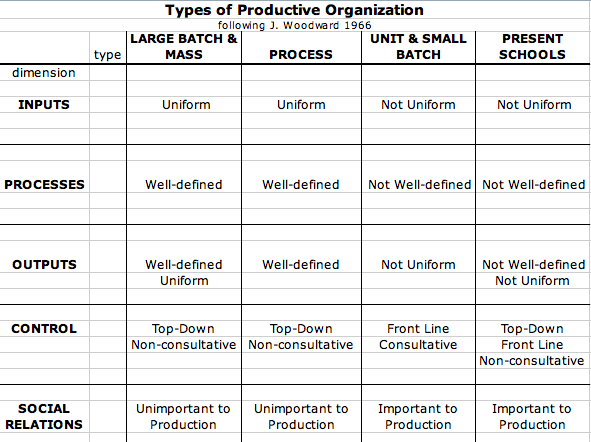 Chart 1 below summarizes the relationships between inputs and outputs for the different organizational types. American schooling ideologies make these models problematic in trying to characterize schools as production systems. Progressive as well as "scientific" ideologies tend to see the relationship of technical to social functions of the school to be that of Unit and Small Batch systems. But given their size, the production control of most schools defaults to that of Large Batch and Mass systems. When we compare American public schools to Woodward's paradigms of productive industrial organizations, we can find ample reason in Chart 2 why they may be doing less than a sterling job. Public schools, like Unit & Small Batch organizations lack uniform inputs although in numbers of children handled, they resemble more the Large Batch & Mass manufacturers. As with Unit &Small Batch companies, social relations are important, but public schools are far more subject to non-consultative, top-down control. What interferes with productivity in schools? Politics. "... every student is inspired and prepared to be a passionate lifelong learner and a productive invested participant in the local and global community." Making a decision on the basis of rules, policies and precedence, however complex the process may be, need not engage one in politics, so long as priorities are spelled out. But the more decision-makers are concerned with "being discreet" or with "not setting a precedent," the more political a decision will likely be. People are political to the extent they are willing to "work outside the box" to achieve their goals without damaging the box too much, since sharing the box with competitors promises more than going it alone or "fighting the system." This participation, reluctant as it may be, is the essence of our American box, our democratic society. Unfortunately, many people in our democratic system also talk up a prejudice against "politics," often using the word signify something unseemly or low. This calumny is often little more than a sign that someone's own ox has been gored or ignored. A major concern in our public schools is the placement of special education students in regular classrooms. This is generally seen as involving "politics," i.e. favoritism. Although school people attempt to follow supposedly equitable legal procedures the reality is that, not infrequently, parents' importunities are accommodated by boards of education to avoid costly lawsuits even though those concessions cannot be treated as setting a precedent. There is generally no set procedure to handle such cases. Elementary school principals decide student-teacher assignments for the next school year usually to be published at the beginning of summer vacation. Principals know they will face imperious parental requests that their child be changed to the classroom of whom they consider the "best" teacher in the school. Discreet negotiation, rather than rules, decides the outcomes. Equity is not spoken of. Rostering, i.e. class scheduling for students and teachers, can be easily politicized even if done by computer in a central administrative office. The principal, wanting to punish or reward someone surreptitiously, need only have made up in advance "contingency rosters" for Mr. /Ms. X (to be victimized) or Mr. /Ms. Y (to be given perks) in which substandard (or superior) facilities along with classes composed of "troublemakers" or "geniuses" are heavily loaded. Politics such as this are as likely to hurt student achievement as accomplish the principal's goals. Schools board members, the "uppers" in the system, are rarely challenged by their employees, the superintendents, principal or teachers, i.e. those with first-hand knowledge as to how their actions impact on student performance. Their decisions can have substantial impact on student achievement, which, if negative, is likely to be ignored. In the School District of Philadelphia, about 1975, a board member was shocked to find out no one could tell him what non-real estate property the school district owned. Then, apparently without much forethought, the command was issued that students (about 200,000) were to be sent home for a week while teachers applied numbered labels to desks, chairs, blackboards, TV's, lab equipment of all kinds -- even boxes of paper clips. Inventory lists were to be created and submitted at the end of the week. And so it was done. There were no control mechanisms in place. There was no sampling to estimate the accuracy of the inventory sheets. There was no double-checking. In fact, there was no provision made for collating the information collected. When standard-test-time rolled around soon after, a local newspaper reporter -- unofficial spokesperson for the school board -- came up with the by now all too familiar explanation for low scores: poor teaching. The question to be asked is whether Brunsson's contrast between an action vs. a political organization is more or less the same as the contrast developed in this article between a productive vs. a political organization. So as not to conflate the two concepts, it is important here to distinguish between political organization (PO) as characterized in this paper and a Brunssonian political organization (BPO). AO will designate the Brunssonian action organization; PD, the productive organization as characterized herein. Chart 3 below (with page citations from Brunsson) lays out contrasts and comparisons of these concepts. Brunsson is cited for AO and BPO. PD and PO are characterized, I believe, relatively accurately from my experience with and formal study of organizations in the United States of America using terminology in common usage. b. A much more hopeful -- one might say, even, sanguine -- conception of the tolerant nature of political organizations than I, as an American, can find plausible. My experience -- and, I expect, that of many Americans -- is that political organizations derive their legitimacy primarily from law and are, often with resignation, expected to be used by individuals and groups as tools for their own aggrandizement. We can see from Chart 3 that if we conceive AO-BPO as a continuum and PD-PO as another continuum, they are initially best considered independent, lacking any evidence of correlation. There are interesting overlaps and shared characteristics, but it is far from clear whether Brunsson's models engage the world of organizations we live in -- at least here in the United States of America. In fact, PD and PO are not two different kinds of organization, since productive and political processes can occur in either. We will see below another approach to classifying organizations in terms of several variables that predicts where political action occurs, especially the kind that invites reproach. American organizational leaders do not, as a practice, go looking to incorporate contrary opinion into their ranks . It is not an American trait to seek out ideological difference; but, to yield to it when there is little other option. Political wisdom in this country is to be on guard for the potentially influential persons or groups and coopt them into participation in -- and thereby support of -- the perceived status quo. Thus it is that Americans have only two effective political parties: Republicans and Democrats. The serendipitous result has often been that this conservative approach has had the effect of changing the status quo, but with minimal perceived social upheaval. Most important to point out is that Brunnson is committed to a normative model of rationality that has been extensively criticized as "omniscience" in contrast to models of bounded rationality. This is strange, considering that Brunsson is seen to be in the same tradition, the normative institutional school, as James March and Johann P. Olson who fully accept that reasoning is a bounded process. We will see below that it is his concept of organizational "hypocrisy" that Brunsson thinks makes the difference. We will argue to the contrary. One pragmatic definition of product is: an "item" for which payment can be tendered. It is theoretically prophylactic to consider the many kinds of products that are recognized in many kinds of markets. Some involve "physical" objects or outcomes; many do not. Human interactions of all kinds are understood to be or to yield products -- even if other kinds of hoped for outcomes fail to result. Interaction products may be charged for by the session, or by the hour or other periods of time, e.g. a physician's visit or a legal consultation, or musical instruction. A doctor does not forego payment if she fails to cure; nor the lawyer, if he loses the case. Neither does the music teacher return his fees if the student fails to develop a successful career. Another influence the blinds us to the existence of interactive products is organizational ideology. Only "official outcomes" count as products; outcomes of the transactional sequence leading to the successful completion of official goals may be disregarded as products. If we conceptualize an organization as a group of individual transactors each engaged in multiple and possibly simultaneous dyadic bargaining relations -- following Chester Barnard's "atomistic" insight -- then it is primarily, if not solely, organizational ideology that helps participants to conceptualize their group as an organization and brings them to disregard transactions that don't cross organizational boundaries out into the environment as non-productive, i.e. "merely" supportive to productive goals. Brunsson's claim that talk and decision are, unlike subsequent action, not products disregards the economic realities of consultative fees, or medical or legal advice, which requires payment quite independently of any subsequent action taken to them or even successful outcomes in the long run. Brunsson appears to confound means and ends to distinguish his action organization (AO) from his political organization (BPO). The goal for many a political organization (PO), particularly governmentally related ones is to acquire resources, monies, access, etc. for its members or constituencies; very much what the goal is for any action organization. What varies is the means. Aside from political parties, when their primary purpose is to organize voters so as to gain organizational power via elections, we can treat political organizations as service organizations, as we do hospitals -- which do not cure everyone -- and schools -- which do not educate everyone -- and agricultural extention agents -- who may not succeed in increasing crop yields. The fact that there may be a discontinuity between talk, decision and action may be an accidental rather than essential characteristic of political organizations. Most broadly considered, politics is accommodation, that is, recognition and support of individual difference. But not all accommodation is politics. In the push and shove of daily life, we tend to call someone's dealings with another -- seldom our own -- "political" if they engage in procedures not formally recognized by an organization, especially if they are done discreetly (so as to "not set a precedent," as it is normally explained). A person who applies for public assistance and goes through the application procedures required is not engaged in politics. Another person who receives the benefits of public assistance but who bypasses the normal processes of review of need is involved in "politics," used in its most derogatory sense. Outside of the context of political parties, a person who receives a promotion in accord with legitimated procedure or tradition is not perceived as a "political" appointment. Someone promoted in disregard to legitimated procedure or tradition is. We look suspiciously at "politics" because there is a possibly of "misdoing" and "inequity," i.e. our not getting "our fair share." Discreet doings are by definition not open to public inspection; nor are they available to everyone on an equal basis. Only when accommodations are made in a public, rule-governed manner do we withhold the term, "politics," in its common derogatory sense. Accommodations that follow some generally agreed upon structure, a hierarchy, of values are not normally condemned as "political"  unless by so condemning them we intend to challenge or condemn an otherwise legitimate structure. This is an important point: where accommodation occurs within the framework of a consensus on values, politics will be minor, involving decisions on matters overlooked, seen as too trivial to involve organization resources in their codification, e.g. who gets the corner office, whether or not holidays are celebrated by in-house parties, etc. The real worry about politics, which invokes its derogation, is that it tends to exclude the concerns of stakeholders who may in fact be in the majority and resistant to a specific accommodation. To return to an earlier example, a major concern in our public schools is the placement of special education students in regular classrooms. Although school people attempt to follow putatively equitable legal procedures, the reality is that, not infrequently, parents' importunities are accommodated by boards of education to avoid costly lawsuits even though those concessions cannot be treated as setting a precedent. One consequence of this practice is that students incapable of doing well on standardized tests are dropped into classes whose achievement is measured by those tests and whose teachers and principals stand to suffer from a bad outcome. Another, perhaps more important consequence, is that parents of "normal" children have come to see their children as being sacrificed for the sake of a "privileged" few. Another revisit: elementary school principals dread publishing student-teacher assignments for the next school year at the beginning of summer vacation. They know they will be inundated by imperious parental requests that their particular darlings be changed to the classroom of Mr. or Ms. X, whom the parents "know" to be the "best" teacher in the school. Now, whether or not such politics impact on student achievement, depends on a lot of factors. Parents, themselves, may influence their children's motivation, and consequently, achievement, by talking a teacher's reputation up or down. Or, if, in fact, there is a large discrepancy in student achievement among teachers, the parents' concerns about achievement, though realistic, may be blocked by manouvering external to the school that determine how teachers are hired and retained. Teachers can be surreptiously rewarded or punished by manipulating their work conditions with specially prepared teaching schedules, called "rosters." Rostering can be easily politicized even if done by computer in a central administrative office. The principal need only have made up in advance "contingency rosters" for Mr. /Ms. Victim or Mr. /Ms. Superstar (to be given perks) in which substandard (or superior) facilities along with classes composed of "troublemakers" or "geniuses" are heavily loaded. Politics such as this are as likely to hurt student achievement as to punish or reward the teachers they are aimed at. -- Knowledge of the technical production process. -- Substantial manager control over the input mix. Can these conditions be met in public schools? Let's examine what they mean more closely. Knowledge of the Technical Production Process. Consider such motion pictures as Goodbye, Mr. Chips, The Dead Poets Society, and other widely promulgated media images of teaching. Method is not their focus. Personality is. What methods courses try to get at is knowledge of the technical production process. Many teachers are superb technicians and get results with all kinds of children. The problem is that it is difficult to say explicitly just what it is they do. This is why many feel teaching is more an art than a science. Unfortunately, it is difficult to generalize from one successful classroom the circumstances that led to the particular success observed. This tends to make people believe that good pedagogy is a mysterious matter, and to exaggerate charisma. Substantial Manager Control Over the Input Mix. If we take this to mean that the teacher or principal controls who will be taught, the reality in schools is that such control is minimal, if it at all exists. Public schools must take whoever applies; it is the taxpayer's right to have his or her child enrolled in a public school. A Basically Competitive Environment. This requires that incentives exist for experimenting to find efficient means of production. But parents don't want their kids "experimented" on -- with, perhaps, very good reason. But the alternatives waste much time and resources. School outcomes should not be indifferent to technique. But it is not clear what would count as more efficient technique or that parents would be the best judges. Is a technique more efficient if it brings a few students to higher achievement, or if it brings more students up to a lower common standard? At whose cost should someone else's achievement be gained? This is a political (and moral) question: not a technical one. Managerial Knowledge of Input and Output Prices. What this means is that some standard method of gauging costs and benefits is needed so that a teacher could decide among different techniques on the basis of those costs and benefits. Not only does such a standard method not exist, but both law and tradition militate against this practice in the school. For example, "teaching to the middle" is a practice teachers engage in because it shows greatest gain for a given amount of effort. But special education laws and moral considerations often direct teachers to expend effort on students whose achievement will cost many times that of a normal student. An institutional myth supporting the vast per capita imbalance of resources going into special education in comparison to what goes into educating "normal" students is that although special education students may get the immediate and substantial benefits of expensive placements, the general student populace is rewarded with the distant, probably hypothetical and symbolic benefit of learning tolerance. The Goal of Maximizing Output. This goal is not a priority in schools. Both moral and legal restraints prevent its realization -- not to mention a lack of consensus on what would count as a measure of input and output. Teaching efficiency, for example, is constrained by considerations of morality and status. Nietzsche proposes that one might consider that the morally worst things might be, perhaps, only the worst-slandered things. What makes Brunsson's book initially so interesting is that he takes a vice, hypocrisy, and tries to argue that it is necessary for rational organizational productivity. This cycle, C&P --> B --> Oc --> Ea is assumed closed and connected, Ea --> C&P. However, argues March, there may be attitudes and beliefs which do not affect or are not allowed to affect organizational behavior, e.g. rules may prevent racism in hiring. Conversely, organizational obligations may elicit behavior that has no basis in individual preferences. March asserts that the simple model presented above predisposes us to assume that what appeared to happen, did happen; that what happened was intended to happen or had to happen. He explains that nothing happens that can be used by organizations independent of persons who interpret these happenings as relevant events. Organizational functioning, therefore, requires trust in such interpreters. Unlike Brunsson, March does not push to the conclusion that productivity will be increased, or politics decreased if organizational members narrow their goals and adopt an omniscient model of rationality. Brunsson characterizes talk and decisions that do not result in any action as hypocrisy, even if this failure is a result of external impediments (p. 24) rather than because the participants in an organization process reneged on or made false promises. Hypocrisy is fundamental in political organizations (p. 27) and is the way such an organization handles conflicting demands. Nota Bene #1: Brunsson's usage is not how we use the term hypocrisy in American English. The familiar case of hypocrisy is characterized by the saying: do as I say, not as I do. Hypocrisy occurs when one preaches example to others to act as one would not or does not oneself act. Furthermore, the severe accusation of hypocrisy -- and it is normally no minor matter -- is often deflected in many contexts by showing that the actor's role-derivative duties in certain circumstances supercede normal conversational obligations for frankness or truthfulness. Merely dodging a question or lying out of consideration for others -- known as "maintaining morale" or as "tact" -- does not make one a hypocrite, Kantian proscriptions to the contrary notwithstanding. Whatever hypocrisy translates to in other languages, (in some European languages the closest words are equivalent to insincerity, or imposture -- both with less opprobrium) the argument he attempts to make, that hypocrisy is unavoidable for the well-being of certain kinds of organization, does not persuade in American English. Nota Bene #2: the important point here is not that Brunsson's concept translates badly into "hypocrisy," rather it is to ask, "What is the rhetorical strategem in using a strong word of condemnation to name a potentially important organizational variable?" This strategem, reinforced by his insistence that action is rationally stultifying, places organizational behavior in a queer light. Brunsson assumes early on (p.2) that the raison d'etre of organizations is to "generate collective coordinated action." But does it follow necessarily that collective coordinated action requires "tight coupling" among any talk, any decision and any action? Clients are A, B and C and used as subscripts to differentiate processes. Parentheses indicate parts of process not continued, since unnecessary. The processes are identified separately by focussing on whom they satisfy; they may in fact be the "same" actions from the point of view of the actor. It is difficult to believe that Brunsson means to insinuate that if TA, DB and SC are not tightly coupled, then a political, rather than an action, process is afoot, even if TA= TB = TC or DA= DB= DC or SA= SB= SC. This is a long essay. The rest of this section will be abridged for two reasons: the author's (and presumably, reader's) fatigue and the author's need for more research. In many ways, American are radical pragmatists: it is difficult for them to imagine that something may not be intended for "productive" purposes. Some people want to know what Art is for and can only be satisfied with answer like, "It ennobles the soul (raises the intelligence) of the viewer." Prayer for many a religious practitioner is a means to ingratiate oneself with a deity. Pleasure (or suffering) is the road to happiness, or long life. But like art, religion, or sensation, organizations need not exist for any particular purpose; or for that matter, for any general purpose at all. This is called institutionalization. It comes about through focusing the activities of an organization on things valued intrinsically, rather than acting as an instrument to acquiring those things valued extrinsically. Any organization where the notion of efficiency is strange or out of place is an institution; for example, a sandlot baseball team or a college fraternity. State-sponsored schools, for example, have existed in many countries throughout history for both institutional and instrumental purposes. To use Randall Collins' curricular categories: such schools have undertaken to 1) preserve and inculcate the values of a social elite in their charges; 2) develop economically valuable skills in the students; 3) develop social control methods and dispositions in the students. Other examples of institutions are churches, orchestras, museums, universities, parades, statues, holidays and ceremonies. These all involve some kind of organization if they are to continue to come into existence and persist, and that organization may well, at times, pursue instrumental goals, e.g. fund-raising, legislative action. Individuals in an institution, particularly administrators who depend on their continued existence for a living, may treat an institution as a means to their personal ends. But, otherwise institutions may exist for no generally recognized purpose at all. However, merely to exist as an expression of or for intrinsically valued ends is not necessarily, and probably not at all, to be political. What kinds of organizations can we consistently distinguish? That problem remains. A sketch: Rather than trying to conceptualize organizations along one dimension as Brunsson has done by setting up a continuum bounded at the ends with two contrasting paradigms, consider a multi-dimensional space defined by the following variables: size, functionality, hierarchy, incommensurability, capacity and permeability. The definitions follow. Size -- the number of persons recognized (mutually or legally) as belonging to the organization. We can expect this variable to influence such others as resources, public manifestations, and member acquisition. Functionality -- the number of purposes normally or traditionally associated with an organization. The greater the functionality, it seems reasonable to suppose, the greater the number of claims on the organizational resources. Unless resources grow with size increases, administrative conflicts will grow also. Hierarchy -- the degree of ordering of decision principles. If traditions, policies and rules cover the normal run of problems, conflict will be minimal. Conflict engenders politics, particularly if hierarchy is low. Incommensurability -- the number of non-substitutable values, non-commodities, that members pursue using the organization as a means. If resources are tight and values cannot be bargained with, and hierarchy is insuffient, then politics can be expected to ensue -- if only to maintain the organization. Trade-offs, of course, can only be done with "proxy" commodities or may actually bring the organization to the point of developing procedure with such situations, e.g. by establishing turn-taking, temporary exile, etc. Capacity -- amount of resources available for use by organizational members. An abundance of resources not specifically designated for use toward organizational goals, called slack, is known to reduce internal conflict. Permeability -- the degree to which transactions cross organizational-environmental boundaries. In many organizations participants play multiple roles, only some of which cross such boundaries, e.g. school kids in a club that provides neighborhood services for fees which supplement the official budget. We might expect, also -- on the basis of this characteristic -- that in turbulent environments, permeability will reduce and institutionalization processes increase. But this is merely speculation on an empirical issue. What Brunsson calls an action organization is one where functionality and incommensurabilty is low with respect to size and permeability and hierarchy is high. There is no special kind of organization to be identified as a "political organization." Politics, unsanctioned trade-off behavior, will start to emerge if size and capacity remain constant in any organization as functionality goes up where either hierarchy is insufficient or incommensurabilities appear. Permeability will decrease as resources are shifted to deal with internal conflicts. There is a host of testable empirical hypotheses that can be generated from the above variables, not the least important of which would be a typology of organizations that satisfies our intuitions and predictions. One can have only so many rules on the book and cannot give every specification, itself a rule, for applying every rule in the book. To insist otherwise involves one in a logical infinite regress, generating an infinity of rules. This would involve a search procedure without stopping rules. See Gerd Gigerenzer, "The Adaptive Toolbox" Chapter 3 in G. Gigerenzer & R. Selten (eds) Bounded Rationality. The adaptive toolbox. (Cambridge, MA: MIT Press. 2002) pp. 37 - 36. 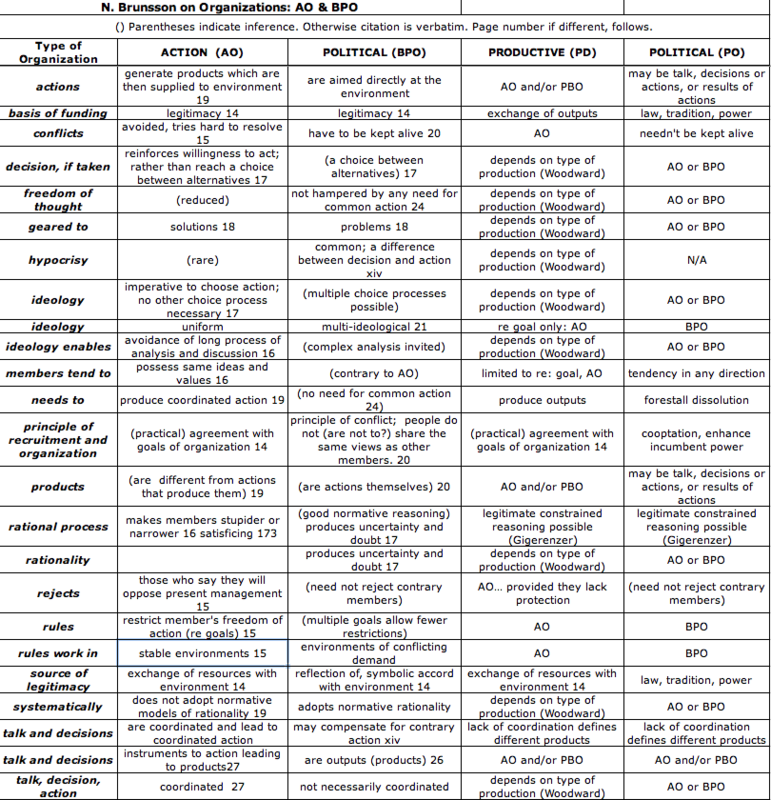 For a quick overview of Gigerenzer's and Selten's heuristics types and comparison with standard computational methods see the "Types of Heuristics" chart at TYPESofHEURISTICS.html. We will not be considering, except perhaps peripherally, recognized political party activities. Our interest is in the less overt activity in "non-political" organizations that not infrequently provokes misgiving, even outrage. We recognize there is a continuum involved here. Brunsson, (2002) The Organization of Hypocrisy. Talk, Decisions and Actions in Organizations. Second Edition. Oslo, Norway. Abstrakt forlag. P. 69. To avoid excessive footnoting, page numbers for citations from this book will be given in the text. See Gerd Gigerenzer and Reinhard Selten "Rethinking Rationality" in G. Gigerenzer & R. Selten (eds) Bounded Rationality. The adaptive toolbox. (Cambridge, MA: MIT Press. 2002) pp. 1 - 12. "The total motivation of a cooperative system...is determined by the marginal contributor." Chester I. Barnard, The Functions of the Executive (Cambridge, Harvard U. Press, 1938) p.44. By contrast, Brunnson (2002) forces the option in organizations between action or politics because he fails to allow for accommodation within a hierarchy of values that govern it. This may be a translation issue . See Brunsson, p. 16 "To put it bluntly, the action organization makes people narrower or stupider then they were before they joined it." However, Gerd Gigerenzer, Peter Todd and Daniel G. Goldstein argue that simple heuristics based on conceptions of bound rationality do the opposite. See Gerd Gigerenzer, Peter M. Todd et al. Simple Heuristics That Make Us Smart (Oxford: Oxford U Press 1999) Chapters 1 & 2. See Richard Warner, "Does Incommensurability Matter? Incommensurability and Public Policy" University of Pennsylvania Law Review, Volume 146, No. 5 (Jun., 1998), pp. 1287 - 1325. Available from http://www.jstor.org/stable/3312807. Warner considers whether incommensurabilities need undermine rational decision.